"If I ever get ahold of you, I will thank you for showing me the futility of human endeavor." The Swedish bartender is a man who works as a bartender at the Swedish bar, Inga-Bar Beerman's. 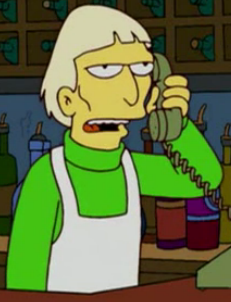 After finding Denis Leary's cell phone, Bart started prank calling bars around the world. He called the Swedish bartender and asked for "Olav Myfriendsaregay". When the bartender asked his patrons for Olav Myfriendsaregay, they laughed at him. The bartender then said that if he ever got his hands on Bart, he would thank him for showing him the "futility of human endeavor". The bar's name is a pun on Swedish film director Ingmar Bergman. The bartender's reply to Bart is a reference to Bergman's works frequently having themes such as death, bleakness and betrayal. Modified on July 2, 2013, at 23:26.